Have you ever gotten a piece of bad advice? There's about a million reason WHY I didn't take that advice, but it shows that not all public speaking advice is created equally. The Internet is full of horrible tips that won't improve your speaking. Here is my top 5 bad speaking tips list and what you should do instead. Unless your audience is filled with Channing Tatum or Angelina Jolie types, this piece of advice is going to unnerve you (or if the audience is filled with beautiful people it's going to be highly distracting). Picturing your audience naked is supposed to help you feel that the audience is as vulnerable as you are as the speaker. It's intended to ease your nerves, but it doesn't help. It just makes you feel weird. Why shouldn't you gaze upon your reflection as you practice your speech? Easy. This turns the focus of the presentation on you and makes you self-conscious. Pretty soon you'll be more focused on the way your nose smooshes up when you say the word “onomatopoeia” instead of being concerned with connecting with the audience and getting your message across. Want tips for making practicing a bit less awkward? Click the button to get my No Sweat Speech Prep guide to practice your presentation in less time and ease your mind. Is your name Jimmy Fallon? How about Billy Cosby? Perhaps you're Billy Murray? If you're not, then starting your presentation with a joke is a bad idea. Audiences remember most what they hear first. If your joke bombs, your listeners are going to remember you flopping. If the jokes offend, well that is even worse. Additionally, you're most nervous at the beginning of a presentation. Telling a joke puts a ton of pressure on you to perform. Why put that kind of pressure on yourself? Tell the audience you're nervous, drunk, hung over, etc. The belief is if you come clean about the fact that you're nervous or had bad personal news before the presentation that this will humanize you and endear you to the audience. It actually makes people think you are making excuses about why you didn't bring your A-game to the presentation. Your nerves will dissipate. You'll be able to rally to give a great presentation despite the fact you're tired or hungover. I hated to break it to her that the WHOLE audience knows you're not looking at them. I can totally tell when someone is NOT looking me in the eye. I bet you can too. Better advice – pick a couple of members of the audience who you are comfortable making eye contact (these are your SAM – Spectacular Audience Members) with and focus on them. Then as you get more comfortable, start making eye contact with more members of the audience. Don't be a victim of bad speaking advice that is bound to freak you out and make your audience frown. Not everything you read on the Internet is great advice. Trust an expert (like me…that Ph.D. in Communication pays off) or ask your coach. 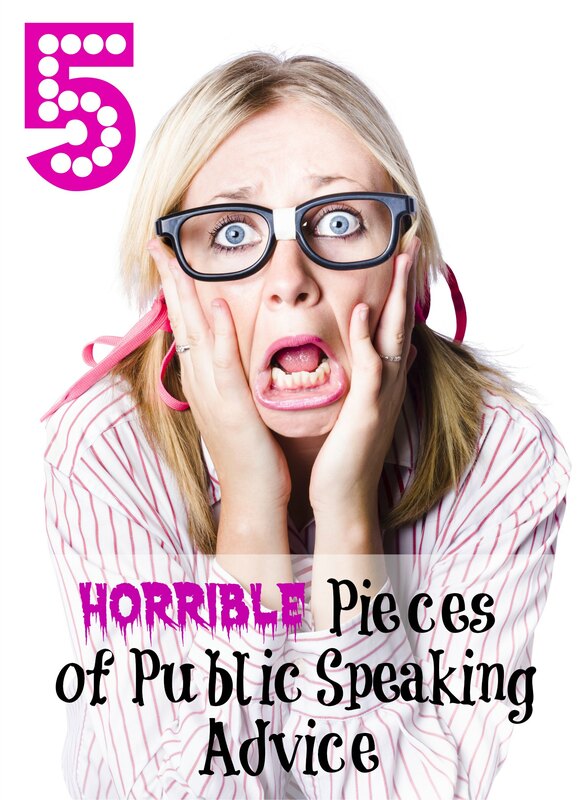 We've talked about bad public speaking advice, but what was the BEST piece of advice you've ever received? Leave it in the comments section below.